There's a town in Italy that doesn't get sunlight for 84 days a year. They've solved this problem with a giant mirror. Viganella is a small town in Italy whose inhabitants dread arrival of the winter season. The reason being that each year for 84 days in a row, the sun would not shine in the town as it went behind the 1,600-Meter high mountain that covered the town. The 197 inhabitants were plunged into a near darkness and just waited for the 84 days to pass so that they can once again feel the heat of the sun. With the sun not shining in the town the inhabitants lived a depressed life a scenario which docs call the 'Seasonal Affective Disorder' or SAD. But finally their pain has been heard of and the authorities have just installed a 8-meter wide and 5-meter tall mirror that has been installed on a mountain so that it can reflect the sun's light on to the town for approximately 8 hours every day. The gargantuan sun mirror is made of an eight-by-five meter (26x16ft) sheet of steel and positioned above a nearby peak to reflect sun rays onto Viganella's main square. 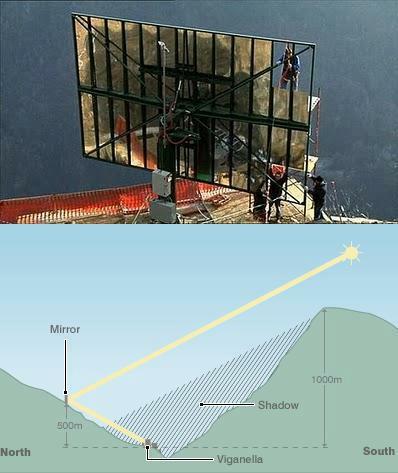 This enormous mirror is completely operated by a computer that regularly tracks sun's path. As this hamlet is situated in the deep bottom of the valley, thus the mountains in the vicinity also cut off direct sunlight. The inhabitants of the town have now begun to smile and have had huge parties to celebrate the first winter sun in the 800 years of the existence of the town. All thanks to the project completed at a cost of 100,000 euros (£67,110), financed by some regional authorities and a bank.